DUBAI: A 17-year-old Dubai girl has launched an unusual project called the Cherry Blossom Initiative under which she has taken it upon herself to infuse colour into the grey interiors of UAE’s labour camps and India’s slum schools by drawing on what the iconic Japanese tree stands for. Shastri said her last project was at the Danube Welfare Centre in JAFZA, which offers daily classes, ranging from verbal skills to ICT, to the company’s labourers. “The moment I heard about what the centre does, I was inspired. This was almost like a labourers’ ‘school’, away from work. Many of us have been privileged to be in a school that empowers us as individuals, whether it is through a verbal, or non-verbal form, such as quotes and board displays, and I wanted to bring this privilege to them too,” said Shastri, who has transformed the centre completely, whether it is the painting on the walls or the desks. “Each trip I made to the centre warmed my heart. It was personally enriching to see how art could bring so much joy and wonder to other individuals; the process of explaining the meaning behind my work showed me how much of a difference such acts can make,” Shastri added. The centre acknowledges her inputs. 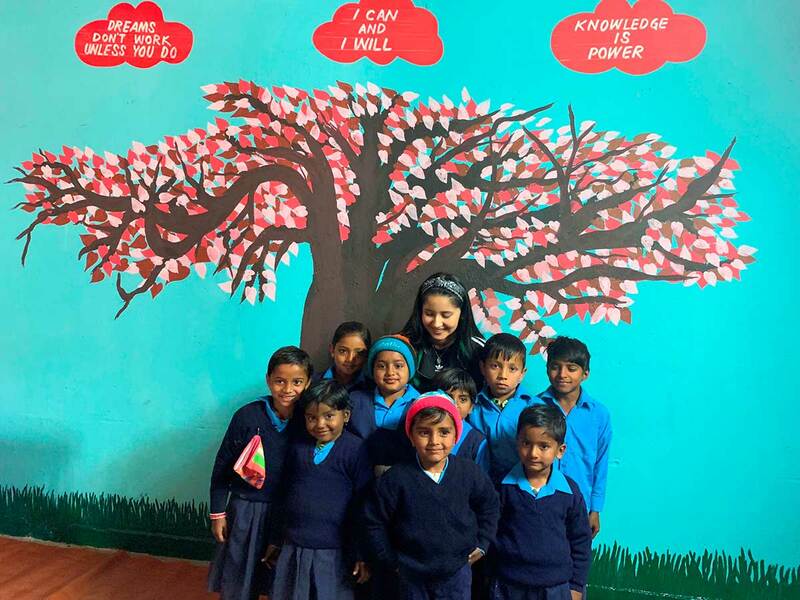 “Jaahnvi has done a wonderful job creating such beautiful cherry blossoms on the walls of our learning institutes. They are beautiful, encouraging and calming to look at for our students. She has created a motivating environment for our labourers and given them a space to relax and grow, just like the cherry blossoms,” said Shabnam Kassam, Director, Danube Welfare Centre. When Shastri turned 17, she chose to mark her birthday with children from a slum in New Delhi, India, where she helped change the very look and feel of the school there. She also promoted cards made by the children and painted her very own Cherry Blossom Tree in one of the main vocational areas. “Celebrating my 17th birthday in the presence of these children made me feel loved and cherished, however, the true essence of the experience was felt when the children in the slum understood the pure meaning of the tree, each making a ‘pinkie promise’ with me to integrate the message within their lives,” she said. “The deep meaning of the Cherry Blossom Tree teaches the Japanese nation that they are Sakura. We all are,” said Jaahnvi Shastri. Cherry blossoms are symbolic flowers of the spring, a time of renewal, and signify the fleeting nature of life. Their beauty peaks for around two weeks in a year, after which the blossoms start to fall. But the idea is to make the most of this period, and focus on its positivity.